The CAO Consigliere is a luxury smoke hand-rolled premium cigar produced exclusively by the master rollers at the CAO factory in Estelí, Nicaragua. Each of these handmade cigars are created with a dark, oily Brazilian Mata Fina maduro wrapper, infused with Honduran binders and a trifecta of perfectly aged Nicaraguan, Dominican, Colombian blended tobaccos. A top-notch premium cigar that delivers a powerful medium to full bodied smoke that’s bold, spicy and very complexed. 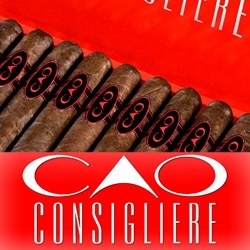 CAO Consigliere are premium cigars that make an excellent choice for any cigar connoisseur. These high-quality smoking gems provide the perfect way to unwind and relax. Every cigar purchased on our online cigar store can be delivered right to your front doorstep. We’ve made it easy and affordable to buy hand-rolled cigars. A variety of sizes and flavors are listed below, each of these styles are in stock and available for a low discount price! Call us for more details!